The Cloverfield franchise continues to surprise with its guerrilla marketing strategies, just as it has done from the very beginning. When that first teaser for the 2008 found-footage monster movie debuted out of nowhere in front of Transformers, it got people hyped and wondering just what the hell it was actually going to be about, leading it to become quite the success at the box office as well as with critics. Then, in 2016, again out of nowhere, a teaser for a previously unheard of film starring Mary Elizabeth Winstead and John Goodman popped up advertising itself as 10 Cloverfield Lane, and once again it got people buzzing about its potential tie-in with the first Cloverfield movie, but while the movie didn’t seem to connect with it much if at all, it earned a strong reception again from both critics and audiences, and it seemed that the series couldn’t do anything further to surprise us. Or so we thought, as yesterday, during the Super Bowl ceremony, Netflix announced that the third movie in the series, which it had been rumoured to be taking over distribution on from Paramount, was not only now titled The Cloverfield Paradox (it was originally titled God Particle), but in an unprecedented move had suddenly made available for streaming on the service, with absolutely zero warning and nothing in terms of trailers or a concrete description, outside of its cast and a basic plot synopsis. It’s a risky thing for any movie to be suddenly thrust out into the world with barely any fanfare preceding it, but if there’s anything that the Cloverfield series has consistently done it’s to surprise everyone by not at all going the conventional marketing route, and up to now it’s worked out pretty well so far. It’s therefore quite surprising, and a little disappointing, to learn that The Cloverfield Paradox is itself not filled with many surprises, and sticks to a pretty safe and stock sci-fi plot that borrows from many other sources and doesn’t set itself apart enough to give us anything new, either. Set in the near-future, the planet is suffering from a global energy crisis, and a group of astronauts have been put onto a space station above Earth to conduct experiments on the particle accelerator which, if successful, could give the planet an unlimited supply of energy. After many failed attempts, it suddenly seems to work, only for the station and the crew to be suddenly transported somewhere in the depths of space, left to survive and find a way to get back home, while encountering one strange anomaly after another that tests each and every one of them. How this movie ties into the Cloverfield mythos is pretty hard to explain, and that’s not just because it would be spoiler-heavy to do so, but primarily because the plot to this movie, as simple as it may seem in that last paragraph (in fact, I may be over-simplifying it a bit), is rather convoluted and tricksy to describe. I will give it credit that it sets up a fairly decent mystery, as you are indeed wondering what the hell is actually going on, and given the twisty nature of these Cloverfield movies you expect a big rug-pulling revelation to give this story a greater meaning. Alas, as it goes along it quickly becomes apparent that the writers of this movie came up with an interesting idea but had no idea how to execute it, and rely on clichés and stock characters you’ve seen a million times before in one of these movies, like Alien or Event Horizon or Interstellar, without adding a lot to it to make it stand out from even those films. It’s like last year’s Life in that regard, where it was basically just a rip-off of much better sci-fi films that happened to have a pretty solid cast, complete with a silly gotcha moment right before the end credits start to roll. That cast, by the way, is the one thing keeping this from sinking completely to the bottom, as each one of them is clearly doing their utmost to make this work, even with the clichéd script and thinly-written characters that they have been given. You’ve got strong actors like Gugu Mbatha-Raw, David Oyelowo, Daniel Brühl and others acting their little hearts out, and they more often than not do a fine job here, but it feels like they deserve better material to work off of, especially as this movie divulges into more and more immaturity and silliness as it goes along, and not even their strongest abilities can disguise how bland the script can become at times. 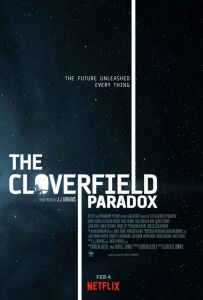 If nothing else, The Cloverfield Paradox is going to be remembered for how it was introduced to the world through sudden and extraordinarily risky means, and could set a new precedent for how certain movies that debut on Netflix and any other streaming service are advertised, or in this case not at all so that the surprises of the film can be left unspoiled by the marketing. The irony is, this will probably be the one memorable thing about a movie that is otherwise pretty forgettable, and nowhere even close to the standards set in the Cloverfield series thus far, making it a major disappointment with an extremely admirable marketing technique. The Cloverfield Paradox will certainly be remembered for its unorthodox and surprising marketing twists, but it turns out it was all for a film that, aside from being the weakest Cloverfield movie yet, adds nothing new to the sci-fi lore or even plot it’s borrowing from much better sources, and doesn’t feature much else of interest to satisfy viewers.